Pad Thai is an all time favourite noodle dish among Thai people. Easy to cook. 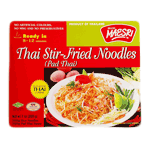 This set comes with 100g Rice Noodles and 100g Pad Thai Sauce. This is the most famous noodle dish in Thailand, Pad Thai, has a subtle balance of flavours usually served with crushed peanuts, fresh chives and a dash of lime. A tasty dish that can be served with your preferred meat or seafood.